PDSA by making a donation, however small. Fellow felines lend me your ears, we have a problem at our house, and it has become very vexatious to our human Bobbie. In fact we are afraid if we don't find a way to alleviate this situation, the poor thing will go round the bend. As you all are well aware, being feline and knowing that we are of a superior species, our superior intelligence and, feline intuitiveness has always kept us on the forepaw of perplexing problems. I am quite sure that if we put our collective intellect together we should be able to come up with a solution. Our cousin Cosmos is a houseguest at our home. He is really quite a good fellow, as houseguests go...but he has a problem, he whizzes! Although whizzing is a part of our natural scheme of things it doesn't bode well with humans...especially in their house. My brother Deco likes to play the role of intimidator, and Cozzie (as he is affectionately called), is petrified of him. Which eggs Deco on. It has got to the point that Cozzie is marking parts of the house as his territory. His thinking is that Deco will leave him alone within his boundaries. Unfortunately Deco doesn't observe boundaries in his own domain. At our house we don't have a yellow brick road to follow, it's more like a yellow stream. I must tell you that between her sprays and Cossie's, there is definitely an unpleasant odor in the house. We have tried to talk to Cossie, but he goes into a catatonic state when we mention whizzes. Any information to eliminate this ordeal, and restore our domain to its peaceful co-existence would be greatly appreciated. Y'all have heard me speak of my cousin Cosmos who has been our houseguest for the past three years. He is finally back in his own domain on Daniel Island in Charleston, South Carolina. Ah know that can be very confusing and, if you think about it long enough, either gives you a headache, or makes purrfect sense. Oh my, Ah am digressing here. 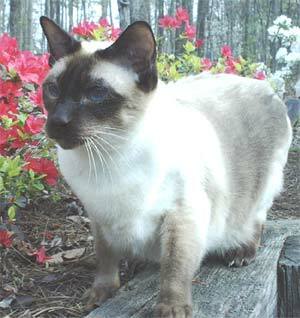 To get on with my tail, Cosmos was not sure that he wanted to leave us; but, when Miss Wendy and Mr. Don showed him his new digs, he thought he had died and gone to kitty heaven. Cosmos was one very ecstatic feline. Cosmos tells us that he is living in a fabulous place that over looks the Wando River. He says he is living grand and loves the screened in porch where occasionally an unsuspecting Gecko or two wanders in and makes his day! Ah can't speak for the Geckos and whether he makes their day for they may wind up an endangered species if Cosmos stays on the porch too long! Our Cousin also mentioned that an alligator lives in the creek about fifty feet from his screen porch. 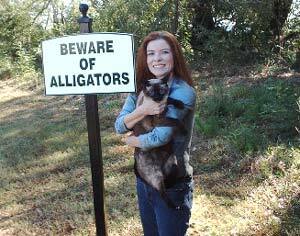 There are signs saying, "Beware of the Alligator!" fixin' to wrestle him away from his home sweet home! Whew! My breath is wearing short pants just thinking about it! Cousin Cosmos won't have to worry about us coming to visit him. Ah myself wouldn't set one chocolate paw neah where any big, old, nasty, gator lived no matter how grand and picturesque it is! Ah don't know if our cousin knows it or not, but, Geckos are distant cousins of Alligators! Ah wonder if I should warn my dear cousin? 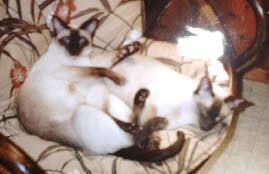 While Cosmos was living the high life, his only problem was that he was alone; and, although he enjoyed being master of all he surveyed, he missed that "Catly Camaraderie" that he enjoyed at our house. Deco intimidated Cossie so badly that it led to territorial markings around the house that got way out of paw and led to some mighty powerful "Whiz Wars!" In fact, on a damp day standing by the sliding glass doors, Ah swear Cosmos has stopped by for a visit. A few weeks ago, Miss Wendy and Mr. Don brought Cossie a marvelous surprise. As she turned the key in the entrance door, Cossie ran to meet her. 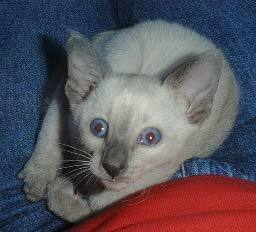 When the door opened, there was Miss Wendy with an exquisite blue point Siamese kitten in her hands. She knelt down and placed the kitten on the floor facing Cosmos. Sapphire eyes met sapphire eyes. Miss Wendy said, "Cosmos, say hello to Finn, (short for Finnias) your new little friend." 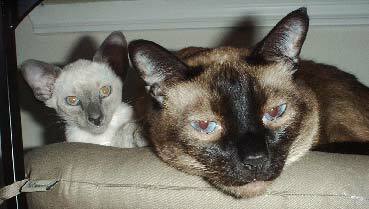 Cosmos is a very friendly and loving fellow who has an unusually musical voice for a Siamese. He immediately greeted the kitten with a soft mew. The kitten walked right up to him and Cosmos began to purr. Finn took to Cosmos right away and vise versa. 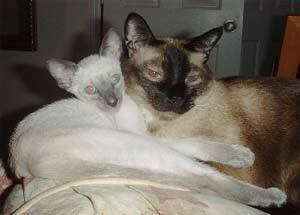 From that point on it was "Love at first sight" and they have been inseparable ever since. How else would he ever have got along with US!! ?